Thursday, April 17, 2008, 6:05pm CST. A man, far from home, suddenly finds himself with $9 to burn and a t-shirt bearing the name of the team visiting Oriole Park at Camden Yards this evening. Armed with but a pen, notepad, and strange interest in vacationing in Baltimore, he set out to capture the Charm City experience. This is his story. For all the glory of Camden, the first park to show the world what a hole Comiskey Park II really was, the stadium creates a few too many eerie divisions to simply be taken for its own merits. To the north, just across MLK Boulevard, are some of the meanest streets in America; to the south at Inner Harbor is the very model of downtown revitalization. 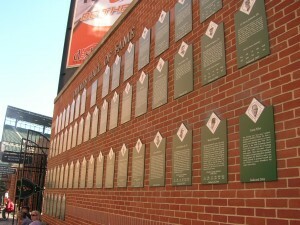 At one end of the Orioles Hall of Fame sit Earl Weaver and Eddie Murray; at the other sit B.J. Surhoff and the chemically enhanced Brady Anderson. 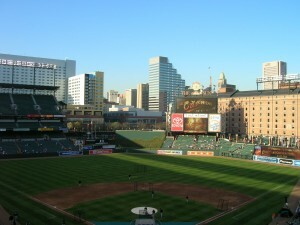 Then again, this is the same city where beautiful women consider Cal Ripken, Jr., to be the perfect man and bleak crime dramas remind everyone of home, so take it for what it’s worth. 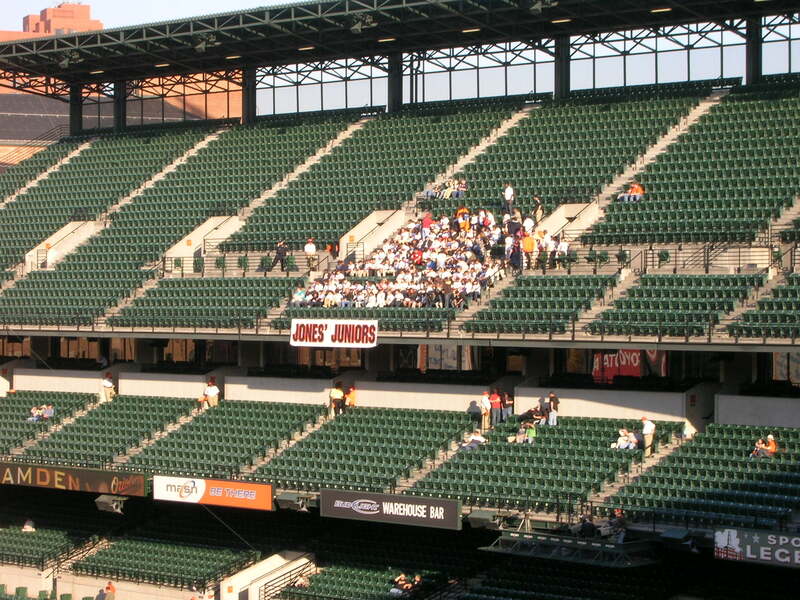 For all the sports-related misanthropy O’s owner Peter Angelos has executed, you have to give credit to the club’s exhaustive charity work and community outreach program. Tonight, the club gave somewhere in the neighborhood of 200 tickets to students at a local school, each sporting a shiny new Adam Jones jersey t-shirt and ready to rock that “Jones’ Juniors” banner the club sent them. It’s a wonderful program, but I had to ask the group supervisor: why Jones? At game time, he’d been an Oriole all of two months and hadn’t done a whole lot more than be a promising prospect. “I dunno,” he answered. “That’s just what they sent us.” Turning charity donations into starmaking endeavors; you gotta hand it to those Orioles. Orioles second baseman Brian Roberts is 5’9″, 170 lbs. He bats first and wears the number 1 on his jersey. Make no false assumptions – Roberts is a really good player – but it’s hard not to envision him calling his folks after the game to ask if they saw him get a hit off the big kids today, and if it’s okay if his friend Melvin comes over to play video games after baseball practice. 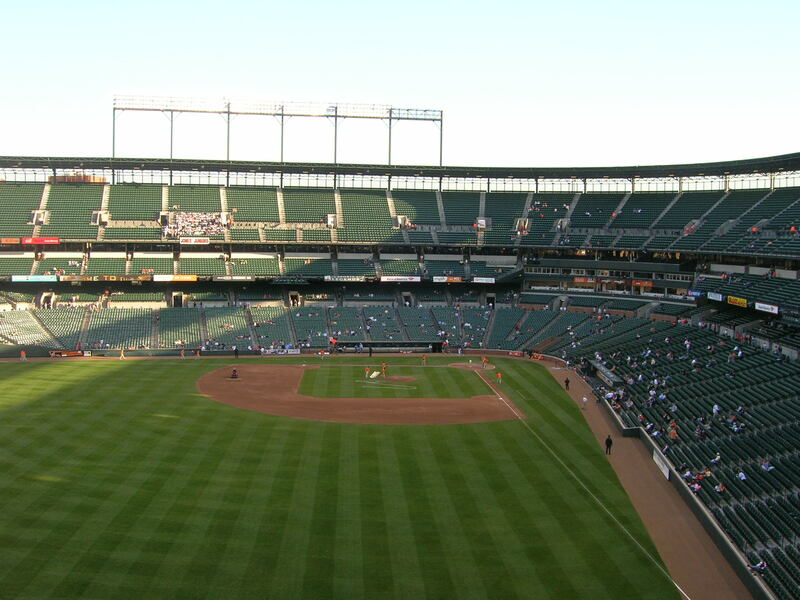 At game time, there were 19 sections completely void of spectators, which makes you wonder why the O’s don’t give away 10,000 tickets to every throwaway game like this one. They weren’t making that ticket money anyway, and chances are there’s a pretty good margin on the excellent $9 sandwiches from Boog’s. Meanwhile, Roberts bobbles an easy grounder and the Good Guys eventually turn this into an unearned run. Just the way I like them. Note to all the Gavin Floyd haters out there: #34 is perfect through two. The Orioles have a special “scalp-free” zone set up outside the park where would-be ticket hustlers unload their extra wares, all while police officers enforce the no scalping rule. A couple at the gate told me to just buy the cheapest ticket possible and sneak into a better seat later; a nearby security guard laughed and nodded in agreement. At the bridge over 35th Street, it’s pretty much anything goes for scalping, bootleg t-shirts, peanuts, and tap water sold as bottled. Advantage: Camden. Conversely, Baltimore is ranked the second-most dangerous of any American city with a population over 500,000. Advantage: Comiskey. No one knows if Gavin Floyd will ever live up to his hype, but it would be nice to believe he’s at least capable of living up to the standards set by his forebears in the #34 jersey: Freddy Garcia, Richard Dotson, and the legendary Bill Heath, whom the Sox paid $6,000 to play exactly one game in 1965. Bill Veeck famously said that the general baseball knowledge possessed by an individual is inversely proportional to how much they paid to see the game. These $9 seats may or may not agree with that, but Veeck forgot to mention that ticket price is also directly related to the aesthetic appeal of women sitting nearby. I say this because there an awful lot of neck tattoos in my section. Pretty med students in Nick Markakis jersey t-shirts? Not so much. But, you know, at least me and the neck tattoo chicks who drove up from Cal City for this have enough money left for another sandwich. Note to self: sneak into any of those 22,000 empty, superior seats later. What’s worse: a 7-year-old in a Ripken jersey, or his 37-year-old father in an Adam Jones jersey? I often wonder how people look at past local heroes who’ve been outed as juicers. I say this not out of spite or contempt, but out of genuine curiosity. Do people still wear these jerseys because the good memories outweigh the awful truth, or is it to make some kind of ironic commentary on the true nature of being a sports fan? 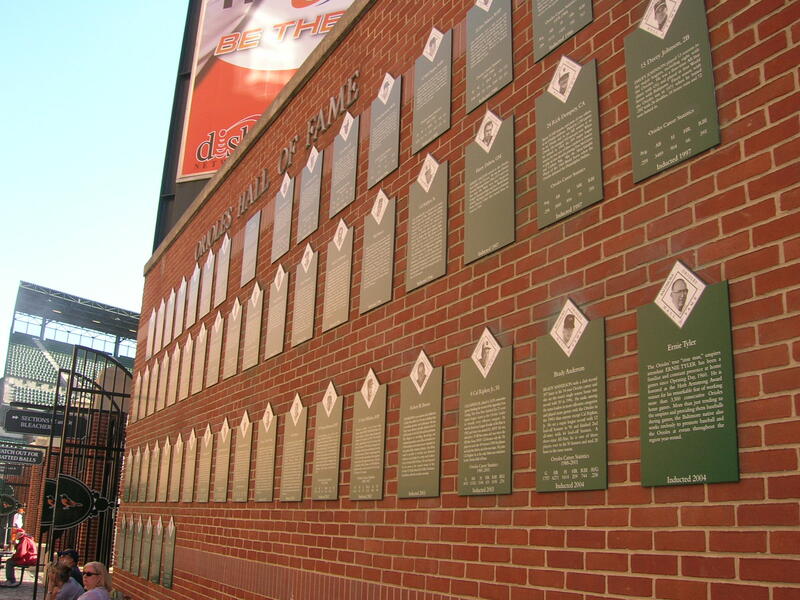 Whatever the case, Rafael Palmeiro can rest assured the people of Baltimore haven’t forgotten him. Whether this is a good or bad thing is anyone’s guess. Adam Jones is hit by a pitch, and neither father nor son storm the field. Perhaps this isn’t such a wild city after all. Kevin Millar breaks up the Floyd masterpiece only to be caught attempting to steal second, which prompts an important question: is it more amazing that Floyd keeps delivering these great performances, or that A.J. Pierzynski actually threw out a runner? No matter what park you go to, there are exactly three types of human featured on the JumboTron: attractive women, little kids, and old people. My compatriots and I up here in section 382, even with all of our $9 genius, go unnoticed and unseen by the good-looking masses below. The public address announcer, who sounds a lot like Principal Skinner from The Simpsons, and the scoreboard both try to incite a “let’s go O’s” from the crowd. Not one fan takes the bait, even after that Markakis home run. Outstanding. Back-to-back home runs, this time courtesy of Joe Crede and Carlos Quentin. This is later followed by a full-on shift for Jim Thome, even with Cabrera on 2nd and the O’s down by 2. Those O’s sure have strange ways of keeping the game tight. There were 19 empty sections at the start of tonight’s game, and there are still 19. 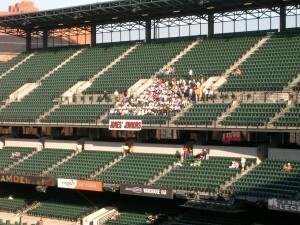 Those O’s fans sure are honest, if not numerous. 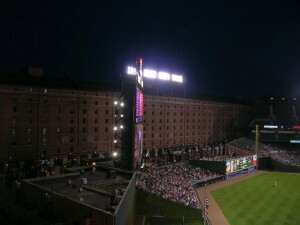 Upon closer listen, the beat for the “Let’s Go O’s” prompt appears to be lifted from the song “Ramalama” by Roisin Murphy. Upon closer inspection, it also appears all of Jones’ Juniors have gone home. And with his second homer of the night, Carlos Quentin has hit more out of Camden Yards than out of The Cell. The Orioles’ mascot is pretty mean, or at least as mean as someone can be while dressed like a giant, fuzzy, orange bird. Taunting the opposing dugout, laughing in their faces between innings, working the crowd relentlessly: I wish the Sox’ mascot was like this. I also wish the Sox’ mascot wasn’t a total embarassment. Is it just me, or is Juan Uribe down 0-2 just by walking to the plate? Someone should look into this. Single, double, single. The longball couldn’t save them and the bullpen blew the game: Sox baseball is back, baby! You have to wonder sometimes if there could be any more average a first baseman than Paul Konerko. He’s an okay fielder, swings a mighty bat, and is one of the franchise’s most popular players. Now quickly, name the one team that can’t say the same. Give up? Here’s a hint: their closer just sat down the Sox in order. You want to say it was the mascot and its bright orange war flag. 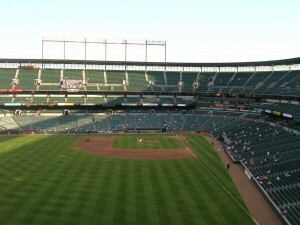 You want to say it was the O’s fans in left field taunting number 20 with the chants of “Caaaaaaaaaar-loooooooos!” You want to say it was anything besides actually being outplayed by the Orioles, although at this point in the season they’re still the “first place Orioles,” so perhaps all is not lost. Perhaps they earned it more than the Sox relief corps gave it away. 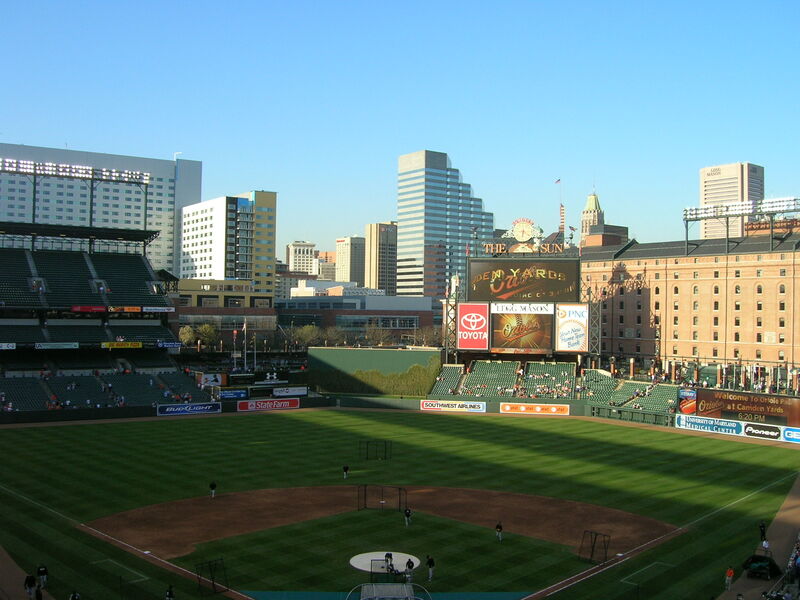 Perhaps anything is possible and Baltimore truly is the last frontier of civility in sport. I ran into that couple again on my way out of the stadium. They asked me about the game, how’d I like the park, tough break with Jenks, all that business. This seemed an odd contrast to Sox games – or at least to the games I seem to end up at – where wearing enemy colors is asking for the verbal assault of a lifetime once the game is over, and God help you if your team actually won. But for a moment there, as Boog’s shut off its grills and all those pretty med students made their way back home, we were all but spectators, our teams clinging to likely-fleeting glories and every one of us wanting nothing more than a chance to visit the harbor again. This was very good and just a pleasure to read. I just have to say that as bad as Baltimore is, you were nowhere near the worst parts. The Inner Harbor is a VERY safe place. I wouldn’t suggest venturing over towards Pimlico, though, because that’s where the city gets it’s crime from. Chicago is safer than Baltimore for sure, but I’m not so sure Comiskey is safer than Camden Yards, although both have that nice advantage of being outside the inner city. Once again, thanks for a great read, and I hope this comment means something to you.